St Michael le Strand Burleigh Street used to stand on the north-eastern corner of Burleigh Street (on the left here) and the Strand itself. 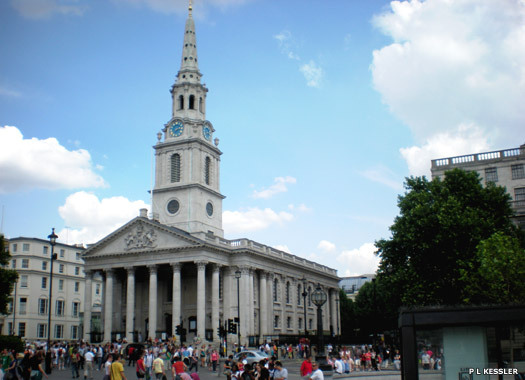 The church was opened for worship in 1833 to cater for the increasing population in the area as the Strand became fully built up. It gained its own parish in 1849. The increasing population had started to decrease again by 1905, so the church was closed, and demolished in 1907. 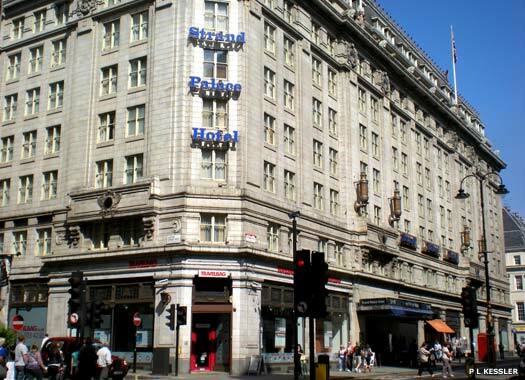 The Strand Palace Hotel now occupies the site. 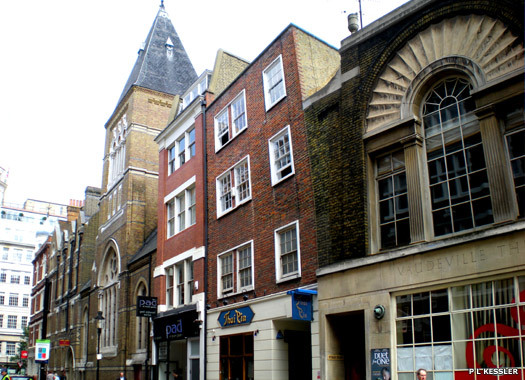 Corpus Christi Catholic Church is hidden away at 1-5 Maiden Lane, immediately north of the Strand. Within the diocese of Westminster, the church was designed by F H Pownall in the early French Gothic style, and was completed in 1873. The designer had trouble with height and space due to the cramped position of the site, and the floor of the church had to be sunk three feet below street level. The church still performs alternate Sunday masses in Latin. St Paul's Church Covent Garden has its main entrance off Bedford Street in the Covent Garden district of the Strand. 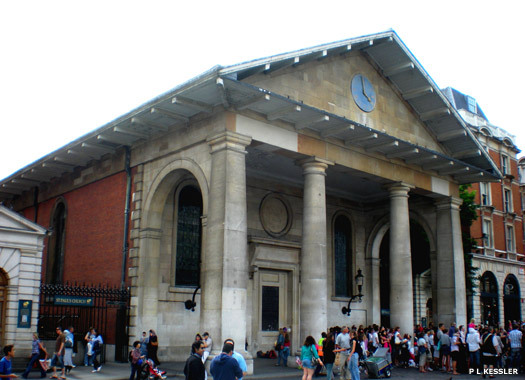 Also commonly known as the Actor's Church thanks to its long connection with the theatre community of nearby Drury Lane, the church was built by Inigo Jones in 1631-1633. It gained its own parish in 1645. Soon afterwards, the first known victim of the Great Plague, Margaret Ponteous, was buried in the churchyard on 12 April 1665. This more familiar view is from the other end of the church which overlooks Covent Garden. 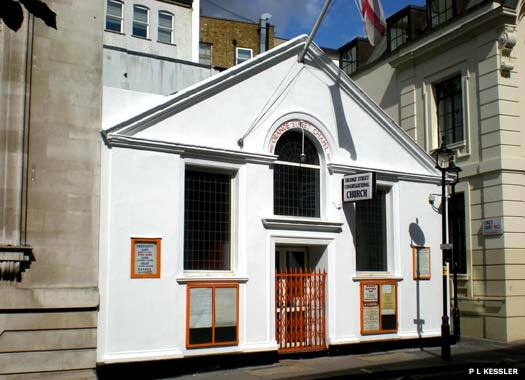 Punch's Puppet Show was first performed here and witnessed by Samuel Pepys in 1662. Thomas Hardwick began a major restoration in 1662, but shortly afterwards the church was destroyed by fire, on 17 September 1795. Rebuilding took place and it re-opened on 1 August 1798. In 2002, the church hosted the first of two weddings for famous pop singers Gwen Stefani and Gavin Rossdale. 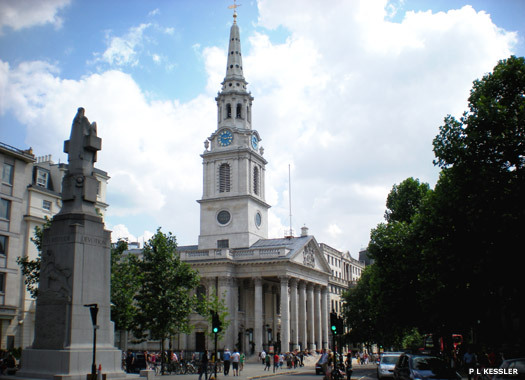 St Martins-in-the-Fields sits on Charing Cross Road, overlooking Trafalgar Square and the National Gallery, while the rear of the building abuts the Strand. The site was occupied by the Romans, but there is no official reference to a church until 1222, when the fields here appear to have been used by the monks of Westminster. In around 1542, Henry VIII built a new church and extended the parish boundaries to keep plague victims from being carried through his palace. The original church was enlarged in 1607 by the son of James I, and pulled down in 1721 to be replaced by the current building in Portland stone. This was designed by James Gibbs and completed in 1726. In the nineteenth century, whilst planning Trafalgar Square, John Nash created Church Path and the range of buildings to the north. In January 2006 work began on a massive restoration project for the church, and this was completed in 2009. Whitehall Palace Chapel stood in what is now Old Scotland Yard, on the eastern side of Whitehall, close to Trafalgar Square. 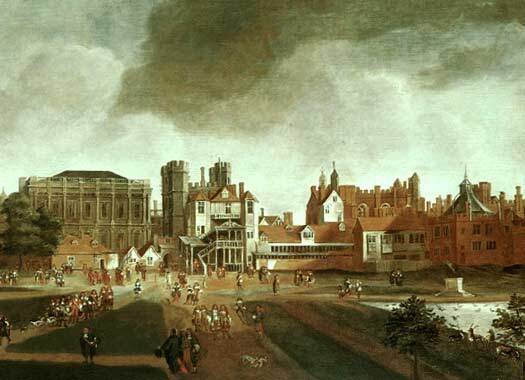 There is some evidence that courtiers of James VI of Scotland who followed him to London in 1603 worshipped in a chapel in the precincts of the old Palace of Whitehall (shown here, by Hendrick Danckerts, c.1675). The site became known as 'Scotland Yard' and subsequently housed the original offices of the Metropolitan Police. Crown Court Scottish National Church was established in Covent Garden in 1711, giving ordinary Scots in London their own dedicated place of worship. In the palace, James II ordered Christopher Wren to build a new chapel, finished in 1687, but Whitehall Palace was destroyed by fire in 1698. William III was asthmatic and disliked staying at Whitehall because of its damp riverside location so the palace was not rebuilt. Instead, Whitehall became the seat of civil government. 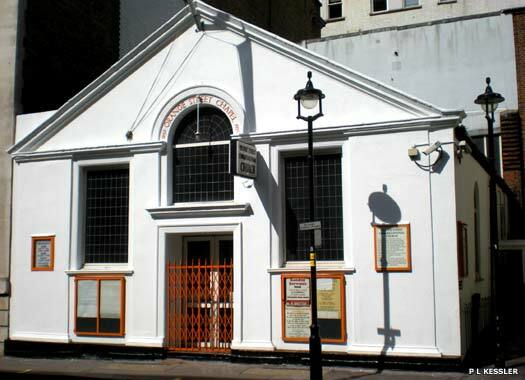 Orange Street Congregational Church sits on the northern side of the street, immediately south of Leicester Square. It was founded in 1693 as Orange Street Chapel by Huguenot refugees who fled from France at the time of the Revocation of the Edict of Nantes. 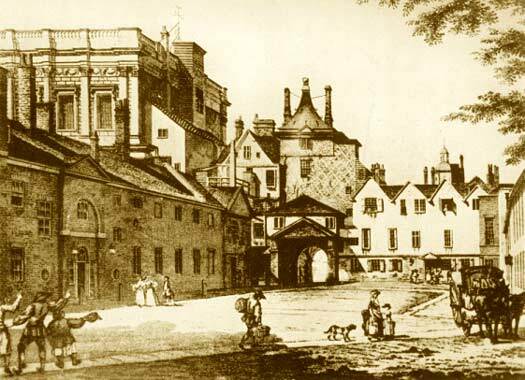 The area was built up in the 1670s, probably by Colonel Thomas Panton, the speculator responsible for nearby Panton Street. The rest of Orange Street was built in the 1690s, partly over the duke of Monmouth's stables. These stables seem to have been called the 'Orange Mews', referring to the colour of Monmouth's coat-of-arms. In 1776, in need of repair, the chapel passed into the hands of the Church of England, and then the Congregationalists in 1787. 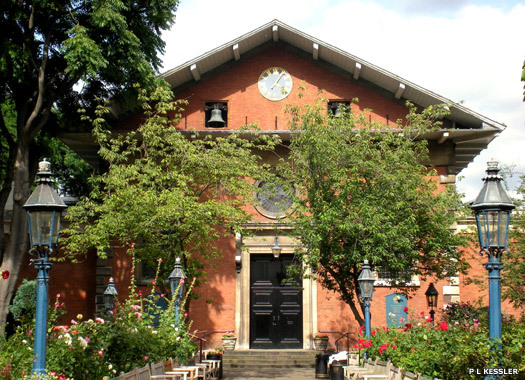 Adjoining the chapel was Sir Isaac Newton's house, which was built in 1710 and condemned in 1913, along with the church itself. In 1925, the council allowed the present temporary chapel to be erected, and it re-opened in 1929.